Not to be confused with Hiranandani Estate. Hiranandani Gardens (or more popularly Hiranandani) is an upmarket township consisting of condominiums, penthouses, bungalows and commercial complexes in Powai in the city of Mumbai. Hiranandani was constructed by the Hiranandani Group and can be accessed by JVLR from the North and LBS Marg from the South. Hiranandani consists of residential buildings, office buildings, hospital, schools, gardens, community centre, sports club, banks, shopping malls, Film studio, bus garage, hotels, restaurants, pubs and swimming pools. Spread in an area of 250 acres, the township houses 42 residential buildings and 23 commercial buildings with a building falling under SEZ category (Kensington). Hiranandani Gardens is also accorded as is also Mumbai's start-up and outsourcing hub. Hiranandani Gardens houses several startup companies, Investment banking firms, Venture capital firms and BPOs. Due to the nature of businesses held in Hiranandani, the Powai area is referred to as India's Silicon Valley. In 1986, the Hiranandani group signed a tripartite agreement between the group, Maharashtra state and the MMRDA for developing 230 acres of land and for constructing affordable housing. The contract was signed at the rate of ₹0.40 (equivalent to ₹4.00 or 5.6¢ US in 2018) per acre. As per the contract, the real estate developer was to construct apartments measuring 430 ft2 and 861 ft2 (50% each) as "Medium Income Group Homes" (affordable housing). Construction started in 1989 and the area then was barren and hilly. The area lacked basic infrastructure such as roads, sanitary sewer lines, water or electrical connections. Along with developing the basic infrastructure, more than 100,000 trees were also planted. By the early 1990s the first phase of apartments were ready and were initially sold at the rate of ₹500 (equivalent to ₹3,700 or US$51.00 in 2018) per ft2. In the late 1990s, the construction and the architecture strategy was changed from "affordable" to upmarket housing and the neoclassical architecture was adapted as theme for upcoming buildings. By the mid 1990s, a shopping mall (Galleria) was constructed at the geographical center of the township. In the 1990s, Hiranandani group constructed Galleria shopping complex in the township. This shopping complex epitomizes the Galleria Vittorio Emanuele II in Milan. Situated at the center of the township, the shopping complex is constructed in two floors and houses banks, parking lot, food court, restaurants, pubs and several shops. The Galleria is a tourist attraction and several movies, commercials, TV serials and songs have been filmed here. Front view of Galleria shopping complex. Hiranandani Gardens houses several gardens and parks; the main garden being "Hiranandani Gardens" (township named after this garden) situated on the intersection of Orchard Avenue and High Street - opposite Hiranandani Foundation School. Other prominent gardens are Heritage Garden (on the Cliff avenue), Nirvana Park (on intersection of Central Avenue and JVLR) and Glen Society Garden (in the compound of the Glen Society on Cliff avenue). Scorpio House is situated opposite Galleria and houses the headquarters of Scorpio Marine Management India Pvt. Ltd. Constructed in 1995, the building is spread over 65,000 square feet. This building was earlier called Bayer House and was the headquarter of Bayer India limited from 1995 to 2013. In 1995, Bayer India acquired the building for ₹30 crore (equivalent to ₹134 crore or US$18.6 million in 2018) (including the cost of land, building and fixtures). Bayer India sought to sell the building in 2002 as well but the sale did not take place due to pricing issues. In 2012, Bayer India acquired 165,000 square feet office space in Hiranandani Estate in Thane and shifted its India HQ to the new location. Scorpio Marine Management acquired the Bayer House for ₹90 crore (equivalent to ₹114 crore or US$15.9 million in 2018) in 2013 and shifted its India HQ to this building and renamed it "Scorpio House". Central Avenue is the main street in Hiranandani Gardens. It starts from JVLR in North and runs for 1.5 kilometers South-West to MHADA colony. The central avenue houses landmarks such as Galleria, Scorpio House, CRISIL House and Powai Plaza. Supermarkets (D-Mart and Haiko Super Market), hotels (Rodas and "Meluha The Fern"), several restaurants, pubs, coffee shops, banks and offices are also situated on this road. Avenue view from Häagen-Dazs & Krispy Kreme side. CRISIL House is situated on the Central Avenue, opposite D-Mart. Constructed in 2010, the building spreads over 211,610 square feet and houses the headquarters of CRISIL (Credit Rating Information Services of India Limited). CRISIL house is a green building and claims to reduce electricity consumption by 40% and water consumption by 30%. CRISIL House on the Central avenue. Situated on the Hill Side Avenue, Hiranandani Hospital was constructed and is operated by Hiranandani Group. The hospital started operations in February 2004 and is the first hospital in western India to receive the National Accreditation Board for Hospitals & Healthcare Providers accreditation. Hiranandani Knowledge Park is situated opposite the Hiranandani Hospital and houses IFCAI Business School. The school offers bachelor's (BBA), master's (MBA) and doctoral (Ph.D) degrees in Business administration and management. The Japanese School of Mumbai, serving Mumbai's Japanese families, is located in the Hiranandani Knowledge Park. Hiranandani Foundation School is situated on the intersection of Orchard avenue and High street - opposite Hiranandani Gardens (the garden). Established in 1990, the school follows the Indian Certificate of Secondary Education (ICSE) curriculum and the International Baccalaureate (IB) teaching programs. It offers schooling for students from nursery to twelfth grade. Apart from the Hiranandani Foundation School Powai, there is also Bunts Sangha S.M.Shetty school and college Powai in the vicinity. This institute follows the SSC and HSC educational programs. They have classes from Kindergarten all the way up to Masters programs. Although Hiranandani Gardens comes under the Brihanmumbai Municipal Corporation jurisdiction, it is the Hiranandani group that undertakes the cleanliness and road repair work of the area. The township is a part of the Mumbai North Central Lok Sabha constituency and Chandivali assembly constituency. Hiranandani Gardens is located in the geographic center of Mumbai city. The township is 8 kilometers East of Western Express Highway, 5 kilometers West of Eastern Express Highway with JVLR connecting both expressways. Hiranandani Gardens is 8 kilometers North-East of Mumbai airport, 35 kilometers North of Colaba, 28 kilometers North-West of Navi Mumbai and 22 kilometers South-East of Dahisar check-naka. Hiranandani Gardens is not serviced by Mumbai Suburban Railway and by Mumbai Metro. Kanjurmarg railway station is the closest Mumbai Suburban railway station (4 kilometers North-East) whereas closest Mumbai Metro station is Saki Naka metro station (5 kilometers South-West). 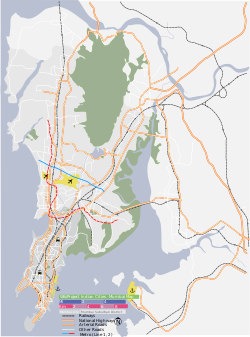 Jogeshwari–Vikhroli Link Road is the main arterial road serving the township from North and LBS marg serving the township from the South-side. Western and Eastern Express Highways are the main highways in proximity (8 kilometers West and 5 kilometers East respectively from Hiranandani Gardens). Hiranandani Gardens has regular connectivity by BEST. Closest airport is Chhatrapati Shivaji International Airport. Many Bollywood films, songs, TV commercials and documentaries are shot in Hiranandani Gardens. Some of the popular films shot in Hiranandani Gardens are Haseena Maan Jaayegi (1999), Taal (1999), Kaho Naa... Pyaar Hai (2000), Shakti: The Power (2002), Chalte Chalte (2003), Khushi (2003), Kalyug (2005), Ghajini (2008), and Slumdog Millionaire (2008). Wikimedia Commons has media related to Hiranandani Gardens, Mumbai. ^ a b "Overview". Hiranandani official website. ^ a b "Powai Hiranandani completes 25 years". DNA India. ^ "Start-up hub". The Times of India. ^ "Hiranandani cant build small homes on plots". The Times of India. ^ "Hiranandani cant build on open spaces". Mumbai Mirror. ^ "Niranjan Hiranandani". Planet Powai. ^ "Galleria Shopping Center". Wikimapia. ^ "Gardens and Parks". Powai.info. ^ "Gardens and Park location". Google Maps. ^ "Bayer to sell off Powai HQ". The Times of India. ^ "Scorpio House contact". Official website. ^ "Central Avenue". Google Maps. ^ "CRISIL moves to green HQ". Powai.info. ^ "Conserve water the Powai way". DNA India. ^ Leslie Morgan Steiner (2013). The Baby Chase: How Surrogacy Is Transforming the American Family. Macmillan. p. 137. ISBN 9781466834682. ^ Josef Woodman (2015). Patients Beyond Borders: Everybody's Guide to Affordable, World-Class Medical Travel. Healthy Travel Media. p. 132. ISBN 9780990315407. ^ Home. Japanese School of Mumbai. Retrieved on 21 October 2017. "住所　Unit No.201/202, Hiranandani Knowledge Park, Technology Street, Near Dr.L.H.Hiranandani-Hospital, Powai, Mumbai-400076. India "
^ "School information". Hiranandani school official website. ^ "DPACO - 2008" (PDF). Election Commission of India. ^ a b "Location". Google Maps. ^ "Film shootings annoy Powai residents". Mid Day. This page was last edited on 7 December 2018, at 07:53 (UTC).